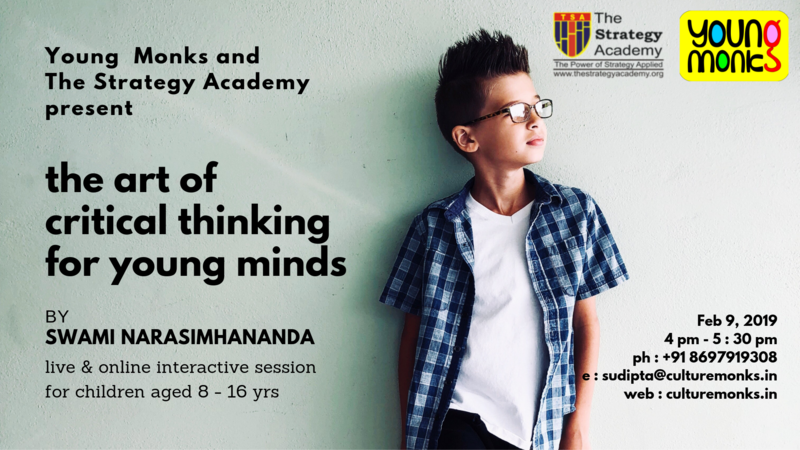 Young Monks starts a new journey in association with The Strategy Academy to bring live & online interactive sessions for children covering topics like arts, literature, philosophy, etc, to foster all round development and access to creative education. We start off with a session by Swami Narasimhananda, themed ” The Art of Critical Thinking for Young Minds “. This session is most suitable for children aged 8 – 16 yrs. Parents & guardians can also attend. You can access this session through your mobile phone , tablet , PC ( with web cam and microphone) or laptop. Demo session prior to the class will be conducted to familiarize you with the digital classroom. Call + 91 8697919308 for any assistance. This discussion would encourage young minds to ask the right questions and ponder on various layers of thought about everyday issues and critically reflect on pieces of creativity like literature, painting, film, and so on. This interactive session would also be a hands-on workshop to elicit varied perspectives from the youth. A monk of Ramakrishna Math and Ramakrishna Mission, Swami Narasimhananda is currently the editor of Prabuddha Bharata, an English monthly journal of the social sciences and the humanities, started in 1896 by Swami Vivekananda. He is a visiting faculty at the Jadavpur University, Kolkata. He regularly speaks at institutes of national importance like the IITs and interacts with the youth in various academic institutions. Besides working on philosophy, social sciences, religion, Indian Studies, Spirituality and Management, Ramakrishna-Vivekananda, and Vedanta, he has edited a volume of Swami Vivekananda’s teachings titled Vivekananda Reader. He writes in English, Hindi, Bengali, Tamil, and Malayalam. Young Monks is committed to brining creative education to children, thorugh events & training programs. Currently Young Monks is conducting theatre training course for children at various places in Kolkata. Please visit youngmonks.club for further details. TSA provides 100 % live and 2 way interactive on line classroom experience with streaming audio & video service, with cutting edge content delivered by facilitators across the world. The Strategy Academy [T S A] is born out of a conviction and a strategy. The Academy facilitates SUCCESS for All, powered by its conviction that individuals and organizations can create and control their futures and destinies, irrespective of what they are up against, and using its own thinking and belief that Success is essentially an outcome of Transformation x Strategy x Action. The Academy uses the new alternative learning solution – SLTS -to design and deliver its various knowledge and skill development programs as well as business and cultural transformation programs.